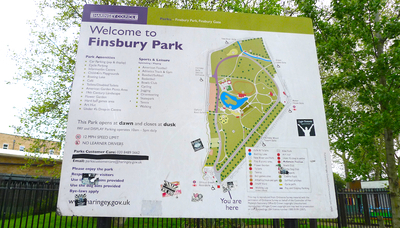 When you hear about all the many things contained within the borders of Finsbury Park, you'd be forgiven for thinking there was no space for any green bits. But thanks to its large size, green bits can indeed be found in abundance, existing happily alongside a superb range of facilities. 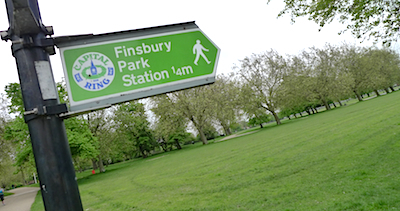 Located a stone's throw from Finsbury Park bus, tube and rail station, Finsbury Park has been providing Londoners with a welcome escape from the chaos of city life since 1869. It recently received a £5 million makeover, helping it to pick up the prestigious Green Flag Award in 2007, an accolade it has won every year since. New facilities include an outdoor gym featuring 14 pieces of fitness equipment, and a dog-free play area for children that includes a special water feature for the little ones to splash about in. A fully refurbished cafe, open all year, is also situated within the park. You'll also find a boating lake, a new skating park, a bowling green, an athletics track, tennis courts, a flower garden, and plenty of walking paths. It even has an American football field, playing host to the London Blitz team, as well as a baseball field, used by the London Mets team. On a sunny day, plenty of shade can be found inside the 110-acre park, thanks to its abundance of mature trees. Due to its excellent location and large size, it's occasionally used for some big music events – the Feis Festival took place there in 2011 and a few years earlier, in 2002, Oasis played to a huge crowd in the park. Music legends Jimi Hendrix and Bob Dylan have also played here. Stroll around it, jog around it, cycle around it. Enjoy a cup of tea at the cafe, play tennis with friends. Watch a sports game, admire the landscaped American Gardens. Visit the Furtherfield Gallery in the McKenzie Pavilion by the lake, relax on the grass, gaze up at the sky and forget about all your worries. You can do a lot in Finsbury Park. If you haven't been, make a plan to visit one afternoon and spend some time in one of north London's most pleasant green spaces. Why? It's a decent size with plenty to do, and never too busy. When: Daily, dawn till dusk. Where: Entrances on Endymion Road N4, Seven Sisters Road N4, and Green Lanes N4.